I was sitting in a café in the middle of Syria's eastern desert, my singed right hand on a large frozen pack of green beans. 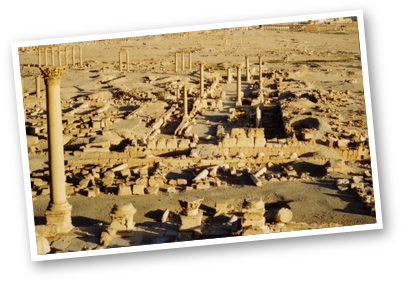 My boyfriend and I were in the town of Tadmor, huddled next to the ancient site of Palmyra, dating back to the 2nd Century A.D. Palmyra was once a thriving, wealthy nexus, ruled by the Romans. A revolt lead by the legendary Queen Zenobia resulted in the city's burning. The defiant Zenobia was carried through Rome in chains. "Fantastic. I need you to help me write a letter, will you help me?" In some ways, I'd like to believe I also made history there. Strange things happen in Palmyra for instance, my scorched hand. As I was leaving to go to dinner, I reached over to switch off our hotel room lamp, ZAP!! I was hit with an electric shock and when I forced my hand off the lamp, I could see the tiny volcanic beginnings of blisters. I ran the hand under cold water then, we headed to a café off the dusty main artery of Tadmor. After getting seated, I asked the waiter for packed ice. He gave me the frozen green beans. Brilliant. As we dug into our pistachio rice topped with various vegetables and bits of chicken, I noticed the waiters were admiring a new three-piece suit in metallic grey, which one of them was showing off. I caught the proud waiter's eye and he yelled out: "You, like?" "It's very smart," I replied, and gave him the thumbs up sign. Intrigued, he came over with his suit, bearing a wide smile. "You speak English? Where are you from?" "Oh that's wonderful. Then, you also write English?" "Actually, I write for a living." What the hell. I was stuck there for the evening anyways, with my blistering hand and my less-than-coordinated left hand spooning food into my mouth. He introduced himself as "Tamer" and had a bushy moustache typical to the men of Syria. "This," he said pointing to the suit, "is for the return of my girlfriend. She is French." Tamer wanted us to write a love letter. He said that a woman from Paris had arrived there three months ago and they got along well - so well, that she abandoned her tour group and stayed in Tadmor for two weeks until her holiday was over. I assumed English was their common language. He gave my boyfriend a pen and paper and slowly dictated the letter out. "My beautiful, lovely Martine …." Tamer was a romantic. It was easy to see how "Martine" might have been swept off her feet by this adoring man. "I miss you much and you are always existing in my mind." I corrected him and suggested: "I miss you so much and I am always thinking about you and wondering what you are doing." It went back and forth like this for about half an hour. "I feel closer to you more and more. Since you are gone, I feel empty and I am wanting you in my arms every day." You get the gist. In the letter, Tamer detailed the conversations they had and implored his French lover to write to him, demanding when she was returning to Tadmor. We discovered Tamer was in his early 30s and Martine in her 40s. Unwittingly, my boyfriend and I were being drawn into the Martine/Tamer vortex. I asked Tamer if Martine's English was good and if that was how they communicated while she was in Tadmor. "Oh no. We can speak a little French to each other. I can write it." Then, why were we writing her in English? "She has asked me to telecopy, you say fax?, letters to her in English to her office because she lives with a man. He doesn't know English." "Oh yes, Martine has a boyfriend for a long time. She wants to leave him. We are in love." Here we were, complicit in the potential break up of a relationship thousands of miles away, of people that we didn't even know. Martine was "Shirley Valentine" come to life. Tamer was grateful for our help and gave us free tea and dessert. I do not have a souvenir of that evening - I never got blisters and I don't have a copy of the letter. Martine, wherever you are, I hope it turned out well.